The hardest thing for any society to do is to avoid oppressing its least advantaged individuals. If we fail to find a truly inclusive set of basic principles, the social structure is not a true social contract but an insider-outsider contract. 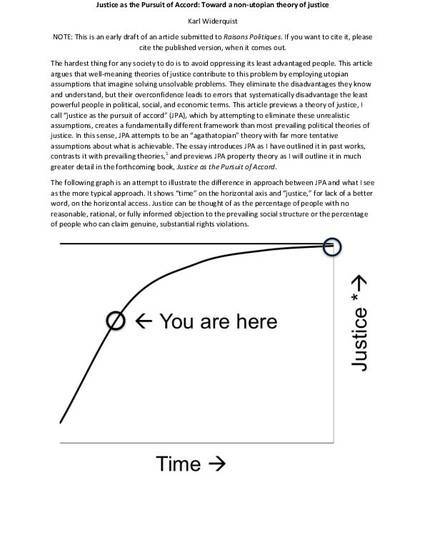 Most theories of justice offer first-best approaches to the insider-outsider problem by assuming that humans can create a basic social structure that no one could reasonably reject. This article argues that no first-best solution to the exists, and that the belief in first-best solution systematically disadvantages the least powerful people in political, social, and economic terms. The article then presents an alternative theory, called “justice as the pursuit of accord,” with a second-best approach. Assuming no all social contracts are insider-outsider contracts, can anything justify a social structure? The article suggests and explains three requirements for justification under these circumstances: the widest-possible accord (literal rather than hypothetical agreement), the minimum negative impact on people who can’t be brought into accord, and constant striving for greater accord.